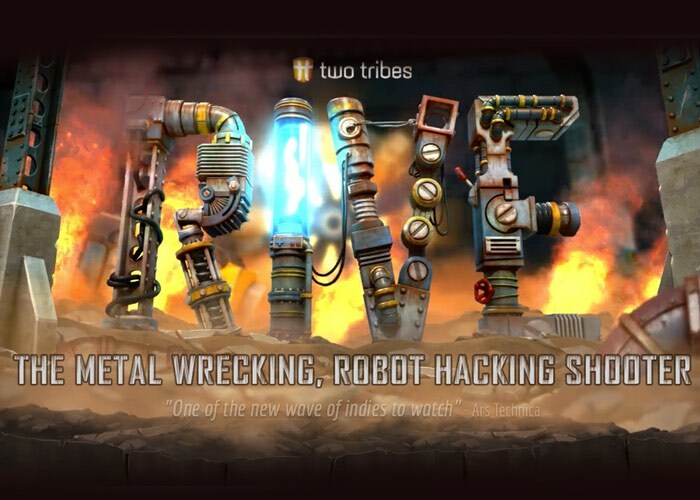 The metal wrecking robot hacking shooter in the form of RIVE is now available to play on both PC via Steam and PlayStation 4 and offers gamers a unique 360 degrees shooter/platform a hybrid with explosive gameplay. Check out the release trailer below to learn more about what you can expect from RIVE which is now available to purchase and offers multiple game modes such as Single-Credit and Speedrun modes. RIVE is a ‘dance of destruction’ during an insane sequence of spectacular battles and setpieces. In the role of space scavenger Roughshot, players can hack their enemies, fire off special attacks, and prove their mettle in multiple game modes. Grab an ammo crate and attack with a burst of Falcons, Teslas, Kesslers or Blunders. Is the battle wearing you down? These special attacks will save your behind every single time.Ever dreamed of controlling your enemies? In RIVE you can. Find the hacks and get those gun turrets, nurse drones and irritable smashbots on your side. Or hitch a ride on top of a bullet train! When space scavenger Roughshot gets trapped on a mysterious starship, he has to form a surprising alliance. Don’t care about the story? Just shoot the messenger. Literally. For more information on the new RIVE jump over to the official website for details and to purchase by following the link below.